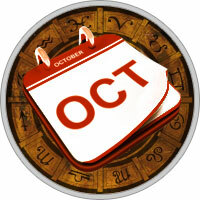 The month ahead is still hectic and hyperactive, but health is good and you are able to handle it. You can enhance the health further through detox regimes, which are powerful all month. Until the 23rd continue to give more attention to the kidneys and hips. Hip massage will be powerful. After the 23rd give more attention to the colon, bladder and sexual organs. Many of you have been more sexually active than usual, but after the 23rd more moderation is called for. If you listen to your body you will know when you've had enough. The main headline this month is the Lunar Eclipse on the 18th: Basically this eclipse is benign to you (next month's eclipse is much stronger). It occurs in your money house and shows important financial changes happening. Often the thinking and planning is shown to be unrealistic and needs adjustment. Investments that you thought were good are not so good. Sometimes an unexpected expense arises that forces the change. (Mars enters your 7th house on the 15th and this brings opportunities for business partnerships or joint ventures.) Jupiter is impacted by this eclipse. Thus career changes are brewing too. These changes are not just personal for you but could involve your company or indus­try. Parents or parent figures should stay out of harm's way this period - children as well. There are life-changing kinds of events for these people in your life. Be more patient with them this period as they are more temperamental than usual. If you are in the creative arts (and many Pisceans are) there is a whole new approach to your creativity happening. Though the eclipse will produce drama and change, this is basically a good and successful month. The Water element is strong all month, but especially after the 23rd. You are personally comfortable with this, but keep in mind our previous discussions. Love is good this month, but lacks direction. There is harmony with the beloved but neither you nor your partner has a clue as to where you are going. Your love planet goes retrograde on the 21st, so it is a time for gaining mental clar­ity. Mercury makes beautiful aspects with Jupiter from the 17th to the 26th. For singles this shows an important romantic meeting. For those who are married this shows more harmony and romance within the relationship. Your 9th house becomes powerful on the 23rd. Thus foreign lands call to you. There are good travel and educa­tional opportunities and religious and philosophical break­throughs for those who want them. Theological discussions can be more interesting than a night out on the town these days.